Paul: Do you like jungles? 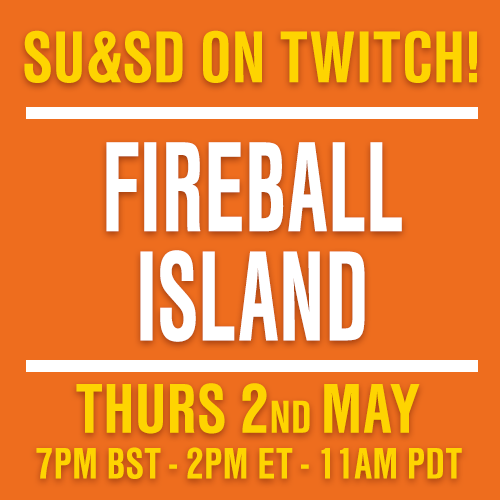 How do you feel about jungles? I think I would be a disaster in a jungle. Coming from the mild and unremarkable environs of suburban Hampshire, where any deviation from the overcast and temperate ambience causes wonderment and confusion amongst the locals, I would be helpless. It seems like everything in the jungle wants to kill or poison you. Everything is massive. The trees are massive. The cats are massive. The ants are massive. But when I saw Cacao, I saw a safe jungle that I could enjoy, a jungle free of carnivorous plants, raging thunderstorms and toxic frogs. Yes, I will happily admit that the first thing that attracted me to the game was how Carcassonne-like it seemed. It has meeples. It has square tiles you lay down as you map out a patchwork world. How gentle! I thought. How soothing. 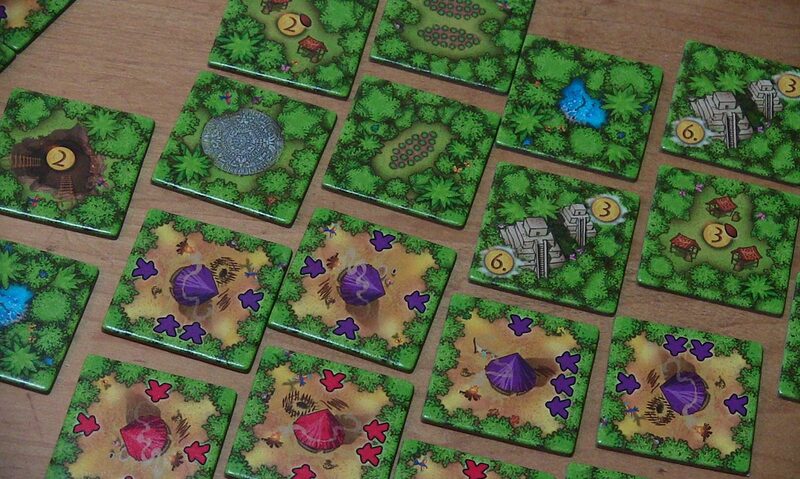 There would be no rumble in the jungle here, just a… while with some tiles? 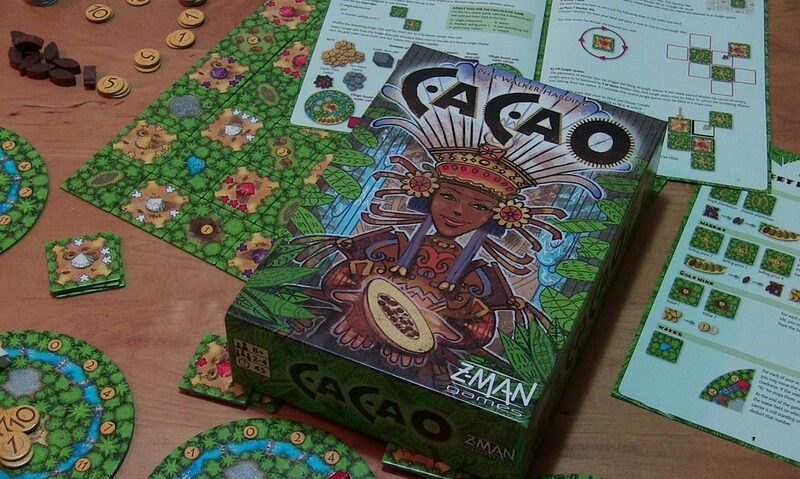 While Cacao is another one of those games that’s basically about getting rich by hoarding and trading resources, it’s not another one of those complex, beige things with an old white dude pointing his arthritic finger at a ship or a customs house or a pile of corn and it’s immediately less stuffy for it. Instead of crates of silk or barges full of, I dunno, wool, Cacao is really just about chocolate. 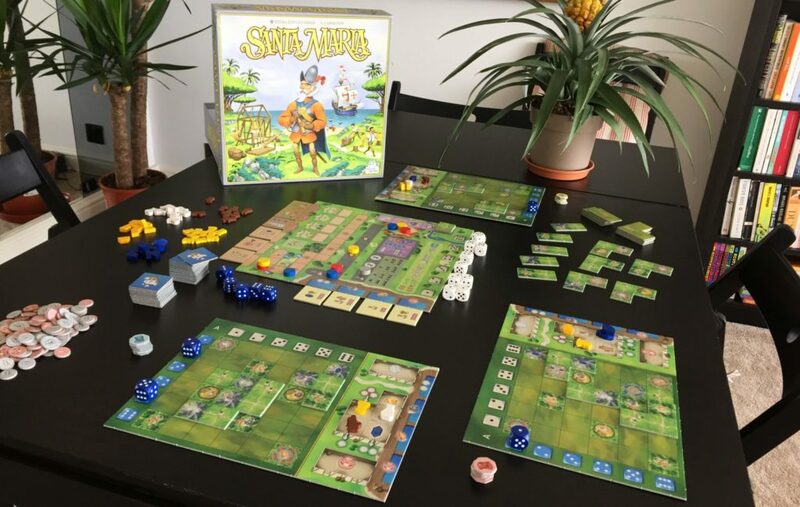 Yeah, there’s temples and gold mines and water, but mostly it’s about getting cocoa and then selling cocoa in a quick, breezy and colourful fashion that can mean a game is as short as twenty chocolately minutes. It looks fresher and brighter than so many of those heftier, sepia-toned things. That’s a good first impression. Also, there are no ants anywhere in the box, so that’s fantastic. 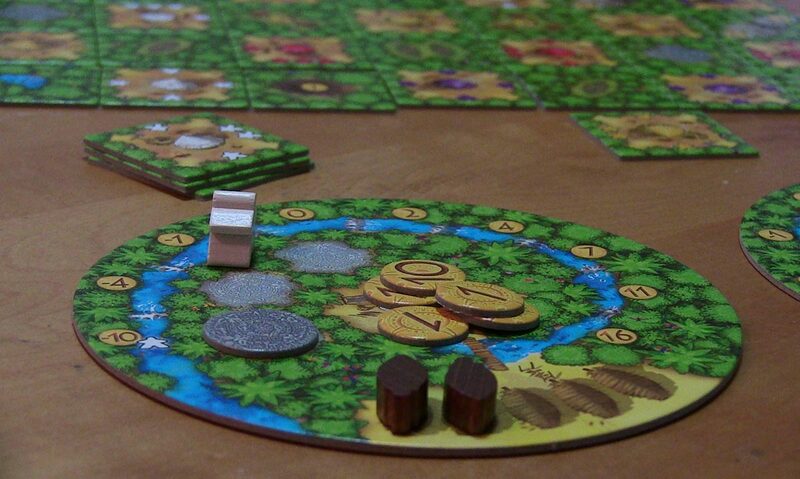 Cacao’s jungle begins as just two tiles, one always your very first taste of all the cocoa to come and the other the first market that you can sell that cocoa at. 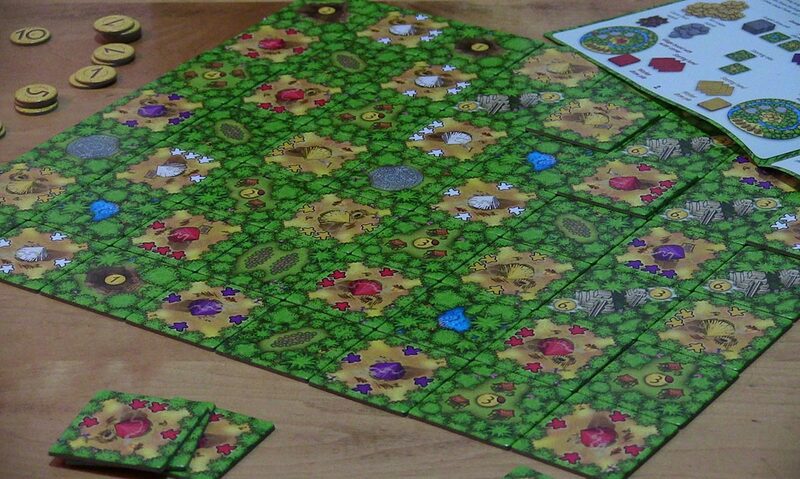 You and your fellow players then start growing this jungle, segment by segment, by drawing from your own personal stacks of tiles, adding these in a checkerboard pattern and filling any gaps that are left with yet more jungle tiles. If there’s one rule in the wild expanse of the jungle, it’s that there can’t be any gaps. Simple! Nice and simple. Each of your own tiles has a particular arrangement of meeple icons around its edges and you lay these tiles according to what you’d like to do and how much you’d like to do it. Arrange an edge with two meeple icons next to a tile with one cocoa fruit and this means you collect one piece of cocoa twice. Perhaps another edge, with three meeple icons, ends up resting against a market with a big gold 2 on it. That means you can sell three pieces of cocoa for two gold each. 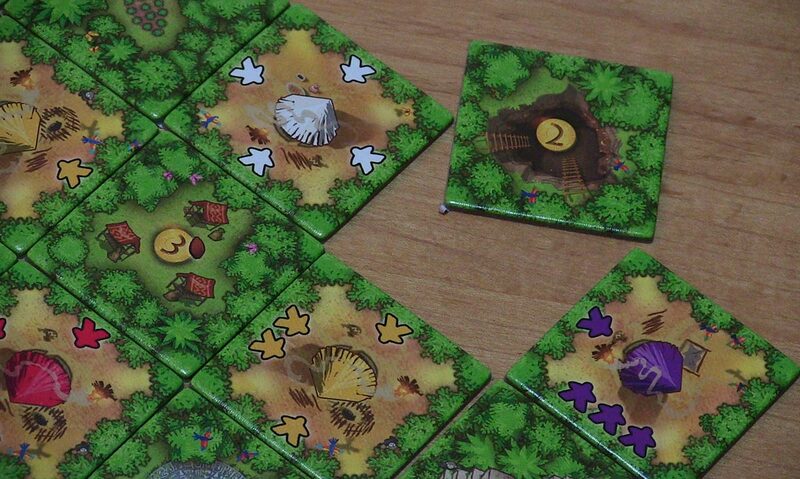 Quite simply, the jungle tiles are possibilities, the meeples you line up next to them are how many times you can indulge in those possibilities. You’ll want to indulge a lot, as making the biggest cocoa fortune is the route to victory. Even in the jungle, money is what matters. Every turn, that jungle expands. 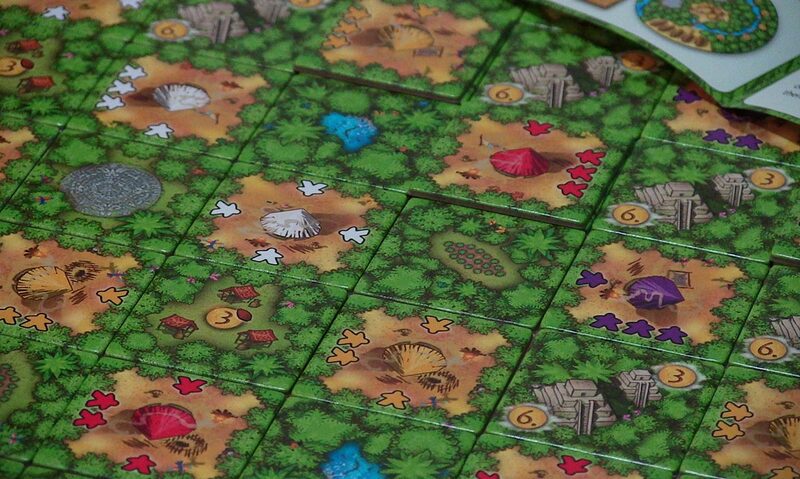 New jungle tiles are laid out and you and your sweet-toothed rivals are trying to find the best ways to fill in the gaps. 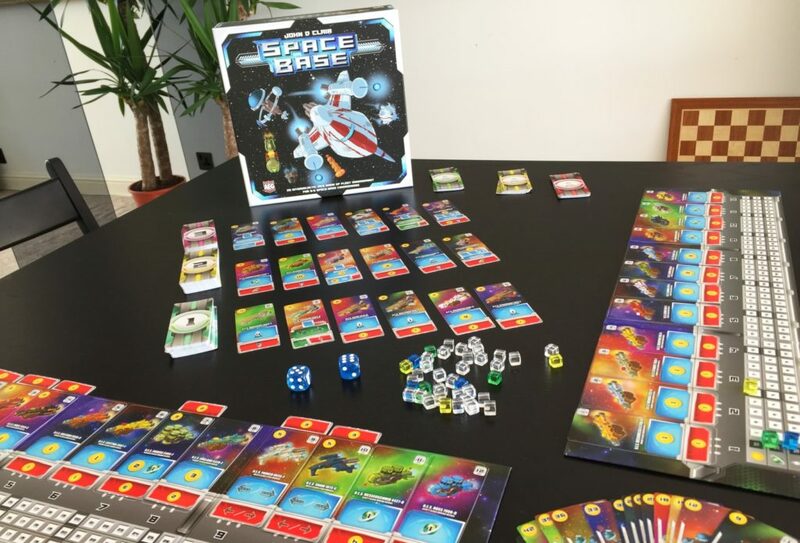 With three of your own tiles always in hand, each of them showing different combinations of meeples along their edges, every turn is a decision about which hole to fill, which possibilities to take and what to hold out for. Obviously, you want to grab as much cocoa as possible and sell it at the markets that proudly wear the highest number but, as I can certainly attest to, you fill up on chocolate faster than you might think. This verdant circle represents your home and all that you are, and within this placid circumference rests the only true and real meeple you’ll ever touch. You’ll notice there are but five places for you to keep cocoa. Collect more than that and the surplus goes to waste, rotting in the humidity, so you’ll always want to be selling it efficiently, almost as quickly as you’re plucking it. You’ll also notice that there are strange symbols etched in the earth and some sort of Escher-like reverse waterfall spiralling up toward your house. This is normal. Do not be alarmed. The jungle isn’t just about harvesting chocolate (though, God, I wish it was). Some of the tiles that turn up show gold mines, watering holes, temples or token-gifting worship sites and there’s gains to be made in staking claims on all of these. Gold mines selflessly regurgitate whatever value is emblazoned upon them, so if you arrange, say, a three-meepled edge alongside them, you reap that reward in triplicate. Water is a resource claimed in the same way as cocoa, but it’s rarer and tracked by your lone meeple. Initially, you have none, which equates to a nasty end-game penalty, but for each meeplesworth (that’s a real unit of measure) you claim, you can gradually turn that penalty into a plus. Serious investment on water-gathering can give you some big end-game bonuses, thanks to how the gold values are spaced out, but that’s inevitably at the expense of something else. Ah yes, the temples! This is where Cacao turns into a little bit of an area control experience. Much like in real life, the way to benefit from a temple is to surround it with more of your friends than anyone else. Temples score six gold for the player who has arranged the most populous meeple edges around it, three for whoever comes second. With some judicious jostling, temples can make you very rich. If you’re the calculating kind. And Cacao is certainly a game of calculating, mostly a game of calculating. Increasingly so as it draws to its conclusion. Is that your sort of thing? It’s possible to attach a definitive, absolute gold value to almost every move you make as you make it, though the unpredictability of the tiles to come keeps you on your toes in the early stages. 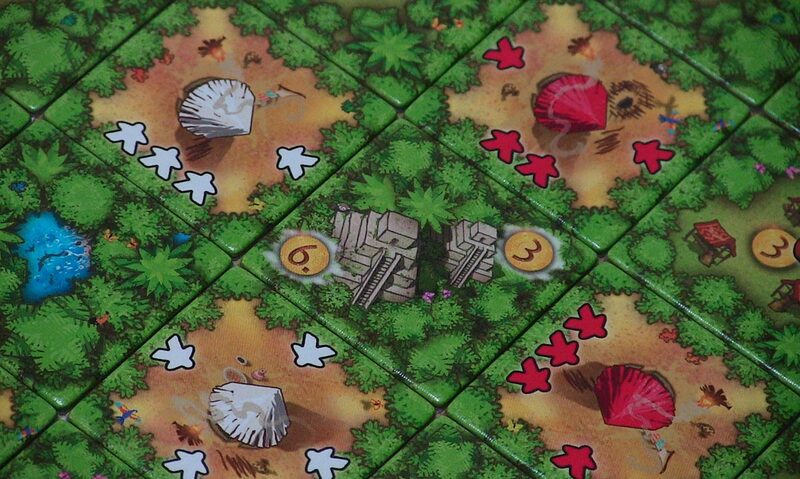 You hold back, keeping your best tiles for what might be better opportunities to come while watching your opponents edge their way around temples or mines, but as the draw piles deplete, Cacao increasingly becomes a game of complete information, a game where you know exactly which move will make you the most money. It becomes both more transparent and less challenging. The moment those jungle tiles run out you can try one final trick. If you’ve managed to squirrel away a couple of those tokens claimed from worship sites, these allow you to lay one of your remaining tiles upon a tile you’ve previously placed, giving you another shot at greatness. Maybe this claims you another temple, irrigates your people a little more or, like me, gives you a final chance to lather yourself in luscious chocolate. Then, it’s all over. 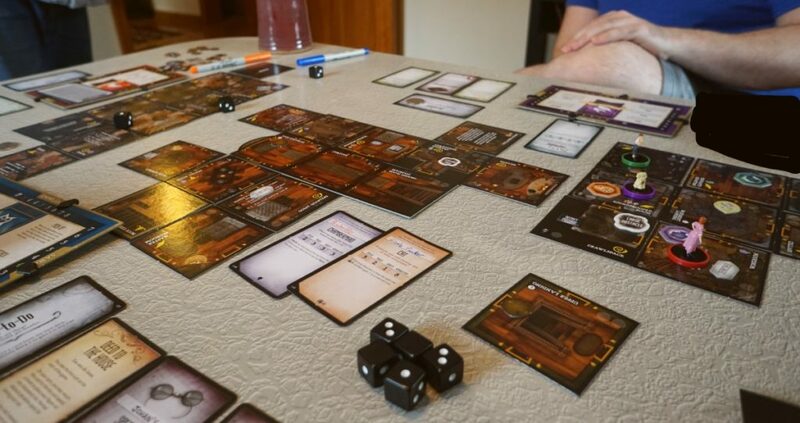 It’s time to work out the richest chocolatier at the table. That was fast. 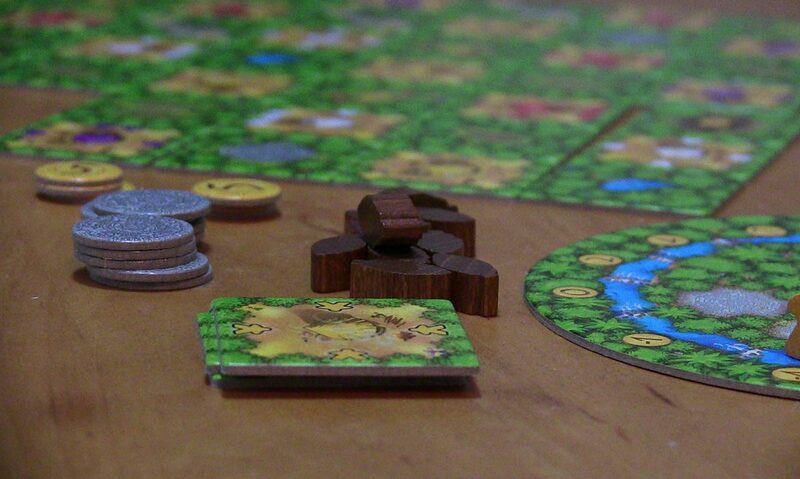 Cacao is quick to teach and quick to play, even startlingly quick with two players, with the end of the game becoming the two of you calculating your best moves and never getting in each other’s way quite enough. With three or four players, there’s more unknowns, much more of a chance of disruption but, while it’s a really very pleasant game to play, I can’t say amassing your jungle fortune is engaging, compelling or very exciting. While it should feel like you’re outmaneuvering your opponents, nudging your way toward their money or subverting their schemes, there’s nowhere near enough of a sense of competition in your capitalism, nor enough of a framework for you to properly plan ahead, to draw up plans that pay off in future turns. You draw, you calculate, you place. Someone else goes somewhere else. Your pretty jungle gets a little larger. There’s no friction. It’s fine. It’s a game for mild-mannered people from mild-weathered Hampshire, a game that never gets too hard, too confrontational or too coy. I left mild-mannered Hampshire a long time ago, in search of more stimulating things, so you can understand exactly why I can’t quite recommend Cacao. Yes, sure, the jungle may indeed have all sorts of dangerous things in its dewy depths, but at least those things have some bite. Cacao, on the other hand, never gives you a chance to properly sink your teeth in. It really is just a while with some tiles.